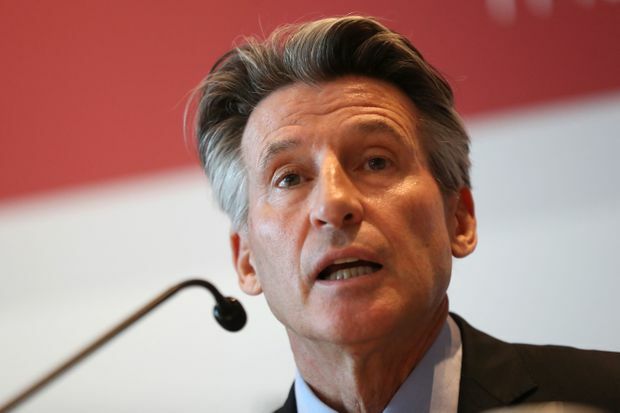 IAAF president Sebastian Coe speaks during a news conference in Monaco on Dec. 4, 2018. The International Association of Athletics Federations on Tuesday upheld a ban against Russia’s athletics federation over doping in the country, pending full access to doping data stored in Moscow and financial compensation. Russia’s athletics federation (RUSAF) has been suspended since 2015 over a report commissioned by the World Anti-Doping Agency (WADA) that found evidence of widespread, state-sponsored doping in the sport. The IAAF said Russia’s anti-doping agency (RUSADA) still needed to meet two criteria – access to samples of Russian athletes in a Moscow lab and full financial compensation for investigation and legal costs – before the ban is lifted. Russia’s reinstatement has been rejected on numerous occasions by the IAAF and should it again fail to meet conditions in the coming months, it could risk missing out again on sending a team to next September’s world athletics championships in Doha, the capital of Qatar. The European indoor championships are even earlier, in Glasgow in March, and take place before the next IAAF Council meeting has a chance to meet to discuss further developments later that month. Since 2015, some individual Russian athletes have been allowed to compete internationally as neutrals provided they met certain criteria that showed they had operated in a dope-free environment. “If the Russians can and will release the [drug] samples is up to them. I hope they will deliver the data by the end of this year,” said Rune Andersen, head of the IAAF’s task force on Russia, sitting next to IAAF President Sebastian Coe. The IAAF said the athletics integrity unit must confirm it has been given the data. “All of the data and access to the samples that it needs to determine which of the Russian athletes … have a case to answer for breach of the IAAF anti-doping rules,” the IAAF said in a statement. “The task force hopes that RUSAF and the Russian authorities will now take all steps necessary to meet these conditions as soon as possible. But the IAAF said it had eased its demand on Russia accepting the WADA-commissioned report by Richard McLaren. “It is not an easy one, as we would have wanted Russia to clearly acknowledge the McLaren report,” Andersen said. The costs of running the task force and dealing with legal appeals by Russia about the suspension are expected to amount to several million dollars. “I am not surprised, but we had hopes because the federation has done lots of work,” Dmitry Shlyakhtin, president of Russia’s athletics federation, told TASS on hearing of the IAAF ruling. Russia, whose athletics team was banned from the 2016 Rio de Janeiro Olympics, has accepted there was extensive doping in the country, but its authorities have continued to deny any of it was state sponsored and access to the Moscow lab data has not happened. The International Olympic Committee and WADA have both reinstated Russia. WADA’s controversial reinstatement in September this year was on the condition that Russia recognize the findings of its report and allow access to RUSADA’s stored samples. Failure to provide access to the full data from the Moscow lab by Dec. 31 could lead to another suspension, WADA has warned.